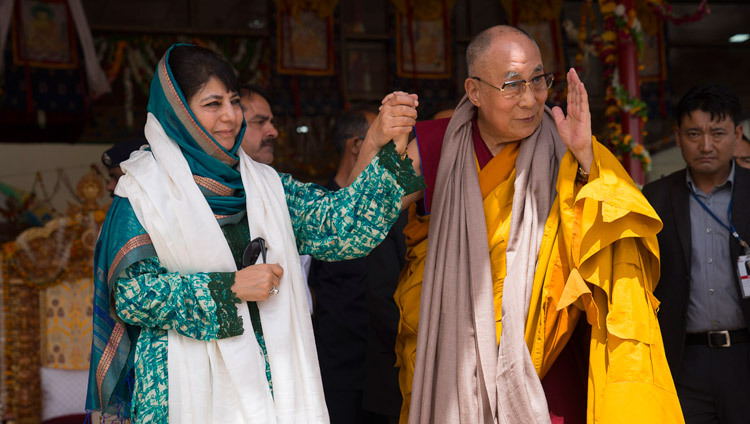 (TibetanReview.net, Aug01, 2017) – On the final of his three-day teaching at Shiwatsel Palace in Ladakh’s capital Leh on Jul 30, Tibet’s exiled spiritual leader, the Dalai Lama, met with Chief Minister Mehbooba Mufti of Jammu & Kashmir. The latter praised him highly as a man of peace whom she would like to invite again. She arrived on the teaching ground for the meeting and addressed the over-60,000 devotees attending the teaching which was organised by Ladakh Buddhist Association. The Dalai Lama, in turn, praised India’s religious harmony and called for developing a deeper sense of oneness of humanity to resolve ongoing tensions in the world.